Jean-Joseph Étienne Lenoir was born in a little house on the high street of the small town of Mussy-la-Ville. In 1822 the town was part of the Belgian Province of the Grand Duchy of Luxembourg and became fully part of Belgium in 1830. It is only two kilometres north of the French boarder and the Region of Lorraine. To this day the population has not exceeded 1200 souls, back then it was just 800, yet it gave the world one of the most influential men ever; on the 12th of January 1822. Lenoir was the 3rd child in a family of 8 children. His father, an ex-soldier, makes his living like many of the small local farmers of the area, peddling vegetables and any other skills he possessed. The population is poor and the climate rigorous yet the people of the area have a solid grasp of craftsmanship and in such diverse crafts as weaving, producing umbrellas, making cutlery and nails for horse shoes. This populace is used to solving its problems by itself and is skilled in the practices of negotiation and trading. But there is no escaping the fact that it was a peasant childhood in the village of Mussy-la-Ville that Lenoir had to endure. "When I grow up, I'll make machinery, new machinery, machinery walking all alone". “Nobody in this country wants to understand what I want to do." In abject poverty, with only an elementary education, no recognisable qualifications and no resources to sustain him Lenoir set off for Paris. He spent three months walking to Paris through the area of Reims Meaux, working in farms to pay his way. Reaching the French capital in the summer of 1838 Lenoir found lodgings at the inn of 'the Auberge de l'Aigle d'Or' on the rue du Temple, were he worked as a waiter to earn his keep. From the humble beginnings of these teenage years would emerge one of the foremost and creatively fertile inventors of his era. Having only an elementary education Lenoir spent his free time with his books, he taught himself about chemistry conducting experiments in a cellar of the inn. By day he worked as a cook and a waiter, but as his scientific knowledge expanded and he attended free Arts and Crafts sessions, so that by 1847 he landed a job in his premier field of chemistry. Applying his skills and knowledge he discovered a way to set white enamel on tin without oxidisation. This technique was used to set the white face on watch dials and was to be Lenoir's first patent. Lenoir continued his research and experiments which developed his interest in electrical engineering and electroplating. Continuing to study a variety of subjects he discovered a way to move air via an engine which ran on lighting gas ignited by electrical means. Another patent followed. Having moved to 139 Boulevard Voltaire Lenoir is already formulating ideas for his engine. Lenoir invented a number of other processes and devices while studying electrolysis. His crowning invention in this area being a method of obtaining galvanoplastic copies or, more put simply, using electricity to build up a metal form over a wax model. Renowned goldsmith Charles Christofle was so impressed he bought the rights to the process from Lenoir and insisted he protect the idea by patent. Further study in silver, copper and chrome plating followed and Lenoir's name became famous when his process was used by Christofle to create the Ornamental Paris Opera reliefs. "Surely there is a better way, let's see about this goblin." Seeking out Alphonse Eugène Beau de Rochas, and doubtless revisiting his earlier ideas on the air engine, Lenoir set out on his journey of discoveries that would eventually lead to his internal combustion engine. Beau de Rochas was of great help with this research and experimentation so that little by little the earlier work of Christiaan Huygens (who used gunpowder to cause a vacuum and atmospheric pressure to move a piston) was developed into the first practical engine that could be used to power devices where water and wind power were not available or were impractical. His financial position was now much more secure thanks to the income from his Patents and inventions. Lenoir could now devote himself to is pursuit of science in all areas of interest. He refers to his professions as "galvanizing" and "chemist" in the Paris census, and Lenoir now lives 6, boulevard des Filles du Calvary. One area of commerce which was booming at the time was that of electromechanical devices applicable to industrial processes. The self-taught engineer Lenoir was responsible for a significant number of inventions in this field. An electric railroad brake and an electrical system for pinpointing and controlling the movements of trains on the railway, including electrical signals (1855), an electric motor (1856), followed by a water meter and a mechanical mixer, a controller for dynamos and a process for the tinning of glass (all in 1857). After months of experimentation and testing Lenoir had a break through in his internal combustion engine in 1858. While patents for similar such engines can be found as early as 1807 Lenoir's engine was the first that could be considered practical and would certainly be the first that was built and sold in sufficient quantities to be considered a success. It was made in the mechanical workshops of his friend Hippolyte Marinoni, in rue de la Roquette, an address which would become famously connected to Lenoir in the years to come. Continuing to refine his engine Lenoir instigated new companies, supported by Petiene et Cie for whom he worked as an engineer, the "Corporation Lenoir-Gautier et Cie engines Paris" and ''Société des Moteurs Lenoir ''. With a capital of two million Francs, amid huge pulicity, and the factory in the Rue de la Roquette, Lenoir started production of his single-cylinder two-stroke engine which burnt a mixture of coal gas and air ignited by a "jumping sparks" ignition system from a Ruhmkorff coil, with a power stroke at each end of the cylinder. Yes, Lenoir patented a spark plug too! This engine did run well for the time although it was very noisy. By todays standards it very inefficient on fuel use and had a tendency to overheat and seize up if sufficient cooling water and lubricating oil were not maintained. But it did run! It ran so well the company built a three-wheeled carriage to experiment with the idea of powered transport, experimentation that led Parisian newspaper ''Cosmos' to pronounced the steam age had ended! 1959 was also the year of Lenoir's invention of another regulator for dynamos, probably required as part of the dual spark plug/Ruhmkoff coil electrical system. 22 arduous years after his arrival in Paris Lenoir achieve his ambition of making a machine that moved by itself and lodged his patent for an “air motor expanded by gas combustion” at the National Conservatory of Arts and Crafts in Paris, receiving the patent N.43624 in 1860. "If it works, I will add a carburettor heating and constant level in which introduce either petrol, or gasoline, or tar or shale or resin any". Lenoir turns on the gas valve and gave the flywheel a push, The engine came to life and the governors controller balls started dancing. The guests were as ecstatic as Lenoir could have hoped, by May 1860 gas engine #4 was set to work in the workshop of master turner Levêque at 35, rue Rousselet. This double-acting, single cylinder, engine of 18Ltr capacity produce just 2 horsepower. He envisioned it powering boats vehicles machines and even aircraft, although realistically it was still too large and inefficient it was the first step on the road to that dream. One Nikolaus August Otto came across a Lenoir. internal combustion engine when he was still a travelling salesman for a grocery business. He was so intrigued he started thinking up ways to improve the engine. Another engineer of the time, François Isaac de Rivaz, also worked on the concept of an internal combustion engine and little by little each successive design improved the breed right up to the current time. Although the Lenoir engine runs on a two-stroke cycle it is quite different from our modern concept of a two-stroke engine as it follows the ideas of Lebon D'Humberstein's 1801 invention. Firstly it doesn't compress the fuel mixture prior to ignition and it has a power stroke at each end of the cylinder, essentially two, two-stroke cycles. The basic lay out is a horizontal cylinder similar in design to a double action steam engine, with a combustion produced alternately above and below the piston. There is a set of fuel gas inlet and exhaust outlet at each end of the cylinder which are all controlled by slide valves. Halfway through the piston travel the intake valve closes and the explosion occurred, giving piston impetus for the completion of it's travel. The "illuminating gas" (the same coal gas used to feed street lights) was ignited by a very advanced “Jumping spark” ignition system. It consisted of two Bunsen storage batteries (accumulators) which fed low voltage current to a Ruhmkoff coil, This in turn sent high voltage current to an ingenious distributor and two porcelain jumping spark “candles” of his own invention. These "igniters" consist of a threaded bolt of copper running through a small threaded pencil of China. The same actions take place at the opposite face of the piston, controlled by the other pair of slide valves. As was common on steam engine connecting rods attached the piston to a fly wheel and translated the motion in a circular form that could be used to power machines. Nevertheless; it was first mass produced engine and the Lenoir cycle is also an idealized thermodynamic cycle often used to model a pulse jet engine. Ever the perfectionist Lenoir wasn't satisfied and continued his research and experimentation. Slowly he was able to improve the output by enriching the fuel mixture to a 10% flammability rather than the original 2% and compressing the gas fuel prior to it's injection into the cylinder. Lenoir also extended the cylinder stoke to make more use of the expansion cycle before moving to the four-stroke cycle, as advocated by his associate Beau de Rochas. Eventually after trying a variety of fuels (bicarburé gas, liquid hydrogen, sulphur dioxide, and even oil), Lenoir was able to obtain an output of 12hp. The excessive heat of the of the cylinder was controlled by the fitting of a water jacket and cooling water was circulated around the cylinder walls and valve cases to help discharge heat. to a very prolific 1,500 built under licence across Europe including Germany and the Reading Gas Works for Lenoir Gas Engines in London, England. According to the Lenoir-Gautier Company they manufactured 380 versions of the engine between January and April 1860. The engines success can be put down to two factors, it was simple to operate and easy to manufacture 'en mass'. The impressive variety of tasks the engines undertook ranged from powering small mechanical items such as printing presses, textile machines, lathes and machine tools to water pumps. This popularity lasted five years and it is known there were 130 machines operating in Paris in July 1864. But the rapid development of technology saw Nikolaus Otto, Karl Benz and Rudolf Diesel producing engines that far outstripped the Lenoir engines rendering them obsolete by 1880. Whatever the production numbers actually were there are plenty of examples still to be found in museums around Europe and most notably at Musée du Conservatoire des Arts et Métiers in Paris. Reports and descriptions of Lenoir's vehicles are contradictory and dated anywhere from 1860 to 1863. It appears most likely that Lenoir had a small carriage built around 1860 in order to work out the principles of automotivation before he moved onto the later multi-passenger vehicle called the “Hippomobile”. To test his ideas the company of Gauthier made an experimental three-wheeled car to which Lenoir fitted one of his engines with the pre-compression system. Lenoir had trouble finding a satisfactory way to contain the 51% hydrogen, 15% carbon monoxide, 21% methane, 10% carbon dioxide and nitrogen "Town Gas" so tried hydrogen generated by electrolysis from water before adapting the engine to run on gas oil which required the invention of a rudimentary carburettor. The engine itself was situated to the rear, underneath the chassis, and connected to the rear wheels via a connecting rod, sprockets and final chain drive. The driver sat at the front on a seat which enclosed a tank for the cooling water. A handbrake was set to his right and operated spoon brakes on the rear wheels. Little by little the problems were over come and defects corrected with innovative inventions and designs. By 1862 Lenoir had built an almost practical automobile with an internal-combustion engine capable of a speed of 3 kms/hour. Clearly a giant step away from any other road vehicles of the day it must have been a sight to see. Lenoir created a motor boat in 1861 when he fitted a 2hp engine into a small boat. This engine ran on a new fuel which had been invented by Laslo Chandor (Laszlo Sando). Encouraged by the success of his experiments and modifications Lenoir created a new automobile incorporating his previous knowledge and a substantially modified engine. The new three-wheeled carriage was built by Société des Moteurs Lenoir at the factory in the Rue de la Roquette and called “the Hippomobile” which meant horse drawn vehicle (although it had no horse!). The "bodywork" was little more than a rectangular construction similar in appearance to common wagon. Sitting high above the tricycle platform, at the front of the wagon, was a bench seat for the driver. Mounted directly behind that, but a little deeper set in the wagon, was a second bench seat. The remaining load area had two longitudinally mounted bench seats so up to seven people (including the driver) could be carried. The longitudinally mounted engine and tanks were slung in a wooden casing, under the wagon body between the rear wheels, which enclosed nearly all the working parts. The final drive was by chain to the right rear wheel only. The rear axle had nothing by way of suspension so the ride must have been rather less the comfortable. Steering was by means of a wheel working on the inner aspect of a toothed ring above the double-elliptical leaf springs suspended on both sides of the single front wheel. The engine was 2543 cc (155 in3; 180×100mm, 7.1×3.9in) probably thinking smaller size and weight of engine would reduce the strain on the carriage. Running on "liquid hydrocarbon" (petroleum) with a primitive carburettor it produced a mere 1.5hp running at 100rpm, reputedly something of a “gas” guzzler too. It was claimed to be silent, however, this was the only true when no load was placed upon it. Lenoir demonstrated his machine in September 1863 completing a 6-mile (10-kilometre) journey from the works at Rue de la Roquette, in the 11th Arrondissement. in Paris, to Joinville-le-Pont on the River Marne South-East of Paris, and back. The total 10km took about three hours (and huge amounts of fuel) to complete, meaning the average speed was something around a walking pace. Doubtless there were some breakdowns and stops for fuel and rest as the actual top speed is reported to be 9kph. Given that the return time is given as One-Thirty pm (ET) Lenoir must have set off at around 10a.m., which is reasonable as it provides an appropriate amount of time to make preparations prior to departure. There is a report of an “historic fifty mile road trip” but I cannot find any description of the event, so put this down to exaggeration and misinterpretation. Whatever the distances travelled the event raised a lot of attention, and as far away as Russia where Tsar Alexander II decided he had to have one, sadly it disappeared during the revolution. In truth the engine wasn't powerful enough to move such a large vehicle and given the huge consumption of oil and water, never mind fuel, it wasn't really practical. The result disappointed Lenoir who abandoned the concept and sold the patent rights to 'Compagnie Parisienne du Gaz'. But the whole affair was a huge step forward for automotive technology, well before Siegfried Marcus and 22years before Daimler and Benz. It has been suggested that between 143 to around 400 'Hippomobiles' were sold though as there are no remaining vehicles, chassis numbers or documents to make a definite statement. Considering some sources say less then 500 Lenoir engines were ever built it is doubtful that they were made in anything like the numbers suggested. The last known Lenoir vehicle was destroyed during the Franco-Prussian War of 1870-1871. After the disappointment of the Hippomobile Lenoir turned his attentions back to the electrical engineering field. He developed a new type of automatic telegraph device that can transmit information in written form. This device proved to be of great value to the French during the later siege of Paris and the Franco-Prussian war. Lenoir also installed his improved 6hp engine in a 12m long boat for a patron of the Parisian periodical "The Illustrated World", one Mr. Dalloz, who used it regularly each Sunday morning on the river Seine for two years! Étienne Lenoir was granted French citizenship in 1870, not for his engines or metallurgical advances but as a reward for services rendered to the country during the Franco-Prussian War, primarily his automatic telegraph which improved communication for the French armies. It didn't actually help very much as the Prussian troops under Marshal Bismarck exacted a heavy defeat upon the French. During 1878, the Paris Academy of Sciences & Institute of France awarded Lenoir the "Montyon Prize" for his work on the enamelling of tin. Lenoir published his book called Recherches sur le des tannage cuirs par l'ozone, (Research on the tanning of hides by ozone) in 1880. It won him the "Grand Prix d'Argenteuil" of 12,000 francs from the Society for the Advancement of Science and the Art. To put the matter into context tannin was becoming rare, and process of tanning hides could take up to two years, Lenoir's work reduced this time so much that usable leather could be had within three days, even three hours! 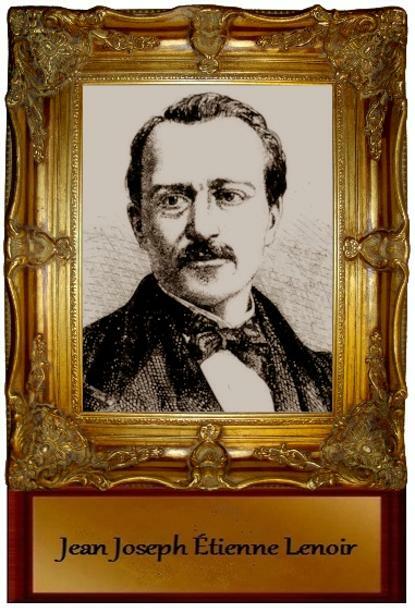 Eleven years after being naturalised as a Frenchman Lenoir was again honoured by France for his distinguished services and developments in telegraphy during the siege of Paris in 1870-1871. This time the Government bestowed upon Lenoir the ''Légion d'honneur'', an award given to French nationals for mérites éminents ("eminent merit" ) in military or civilian life. After the succes of the motorboat Lenoir's interest in engines was rekindled and he worked with Parisian manufacturer 'Rouart' to create a new 4-stroke engine which gained a patent in 1883. A few years later Lenoir had improved his four-cycle engine and altered it to run on Naptha, and fitted it to another boat. Once again the primitive 1863 carburettor gets a mention as it was patented in 1886. Despite his Legion of Honour, a host of awards and distinctions and his inventions and the acclaim Lenoir's later life we not easy. Having devoted his whole life to his work he could only look back on his life and reflect. Impoverished and almost broke Lenoir became a sick man. "In recognition of his great merits as an inventor of the gas engine and builder of the first car in the world "
The fact that this plate was vermeil is very fitting considering Lenoir's early involvement in electroplating and jewellery trade. Vermeil is an amalgamation of sterling silver, gold, and other precious metals, usually used in jewellery. Less than a month later the already sick Lenoir passed away quietly at his home, 114 Rue du Bac in La Varenne-Saint-Hilaire, Paris-Est. The date was the 4th of August, 1900; he was 78 years old. There are sources that record the date of death as the 7th of August but this is most likely confusion about the date of death and the date of registration of the death. No cause of death is specified. His remains were buried in the “Cimetière du Père Lachaise”, Île-de-France Paris. Lenoir is obviously a national hero to the French but Belgians aren't willing to let such a famous man go without recognition either. On the 29th and 30th of May 2010 the governor of the Belgian province of Luxembourg honoured the 150th anniversary of Lenoir's engine. Behind the church in Mussy-la-Ville is an enamelled plaque which commemorates the village's most famous son. As part of the celebrations a new sculpture (by artist Fernand Tomasi, Meix-Devant-Virton) depicting the evolution of the automobile, and featuring a relief of Lenoir, was unveiled in the village prior to being transferred to a permanent home in a park called the common of Musson. A great festival of historic vehicles was held were vehicles up the year of Lenoir's death paraded through the village and the local area. Around 30,000 people descended upon the Musson region for the event. Lenoir is also recognised in his place of birth, Mussy-la-Ville, by the primary school bearing his name. Elsewhere in Belgium Lenoir is celebrated by a marble statue in Virton and in Arlon not only is there a monument but a street named after him. Following in the educational trend the technical institute is also named after the great man, “Institut Technique Etienne Lenoir d'Arlon”. In France the premier memorial to Lenoir is in the Chapel of the Conservatoire National des Arts et Métiers in Paris where a marble slab honours his name. This is very fitting given that CNAM was instrumental in stimulating Lenoir in the first place. CNAM, formally opened in 1802, was set up during the French revolution in the deserted Priory of Saint-Martin-des-Champs to be a house of learning and repository for the collection all scientific information. Given that all the major museums of Europe have an example of the Lenoir engine it is clear his contribution to the scientific world will not be forgotten. Engines can be seen in Paris, London, Cologne, Munich, Vienna and Prague. The ultimate Lenoir authority is Mr. Jean-Pierre Monhonval who published a book about the inventor called “Etienne Lenoir: un moteur en héritage“ in 1985. Sadly it is out of print and extremely hard to obtain. Between 1845 and 1885 Lenoir received almost 80 patents across a diverse range of technical innovation. Constantly striving to improve his invention he cared little for fame, or even money. Etienne Lenoir would have been unaware of the ripples of consequence that shaped the world which we now live in, not the slightest inkling of the impact of his invention. An invention that touches the very core of our modern lives, our environment, our culture, even our architecture and social classes. Cugnot's steam carriage of 1769 influenced Lenoir, Samuel Brown and Rivaz had gas fuelled external combustion engine around the 1820-30s. Nicolas Carnot, French physicist had published his book on thermodynamics in 1824, giving further stimulation to Lenoir. William Barnett and the Reverend W. Cecil might claim development of the first internal combustion engines from their works but Lenoir's 1859 unit is the first remotely practical engine. So; Lenoir can reasonably called the inventor, if not the perfector, of the internal combustion engine. "Lenoir is one of the 100 greatest inventors of all time".